Rats are normally plump and peppy companions, but dehydration can change their appearance and behavior. A dehydrated rat is in need of immediate supportive care at home and follow-up care from your vet. Severe dehydration requires emergency veterinary attention. A rat suffering from dehydration will look thinner than normal. The coat and eyes may have a dull appearance. The classic test for dehydration in any animal is a gentle pinch of skin between your thumb and index finger. A normal rat's skin will quickly flatten back into its original shape when released. A dehydrated rat's skin will flatten slowly; a noticeable ridge may remain for a few seconds. A dehydrated rat will probably be less active than normal and may be lethargic and look depressed. He may sit hunched over and move little. He will be disinterested in food and may refuse to drink water. Rats without access to water can quickly become dehydrated. Check to make sure your rat has a spill-proof water bottle that is clean, filled and functioning properly. Rats with diarrhea may become dehydrated due to loss of fluids through watery feces. 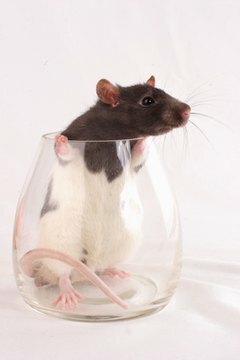 Rats with respiratory infections also may become dehydrated. Try to encourage your rat to drink water by sweetening it with a little sugar and offering it through an eye dropper or oral syringe. Add a pinch of salt and two pinches of sugar to a quarter-cup of warm water. Stir to dissolve. Using too much sugar or salt will further dehydrate your rat. Offer one or two droppers every 10 minutes over the course of an hour. If your rat doesn't noticeably perk up and begin drinking and eating on his own after attempting to rehydrate him with sugar water, consult your veterinarian. A dehydrated rat that is lethargic, refusing to drink or otherwise sick requires immediate medical attention.